This is my first ever all 5-star review. 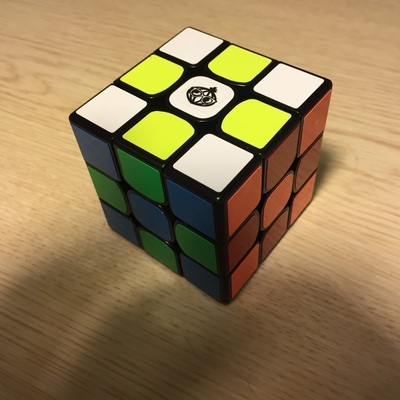 This cube is amazingly fast, corner-cutting is up there with the best, it fails to ever lock up (This is the only play the Gans 356 faltered), It's nearly impossible to corner twist because of the squared off corners, and I can not get an edge out without unscrewing the cube a bit. It has a very light ad airy feel, but with a bit of lube it now has become a bit more controllable and gummy. I still use both the YueYing and MeiYing. 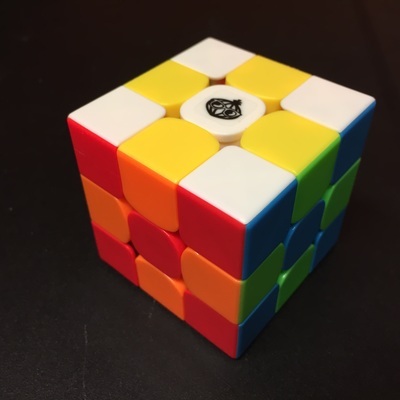 The YueYing is for when I need a slower cube (usually at the beginning of solve sessions), and the MeiYing for later on when my fingers are faster. In the end, this is an amazing cube and perfect for someone who like light and airy cubes. Recently I got the opportunity to test this puzzle, and I must say, I'm very impressed. The MeiYing is a very fast and light cube. It has a slight scratchy feel that I think a lot of people would appreciate. Corner cutting is over 45 regular with 4/5 cubey reverse. Even with that much corner cutting, it doesn't feel like it's going to explode while you're solving it. That's because it won't. Over the many solves that I've done, I haven't had it pop once. It also has squared off corners to prevent them from twisting. Unfortunately, that leads to some miner catching; it's not enough to ruin a solve, but it can get annoying. I love this cube a lot. Out of the box it was very nice. The speed is really good and its a under 20 second cube. But it has popped 3-4 times since i got it, which was about a week ago. A great cube but out if the box. Light and fast, this cube this doesn't pop on medium or later tension and overall performs great. The only downside is it's corner cutting. It can only corner cut a little or 45 and 3/4 of a cubie backwards. If you like light and fast cubes, this cube may be for you. Really enjoy the crisp feel of the cube. 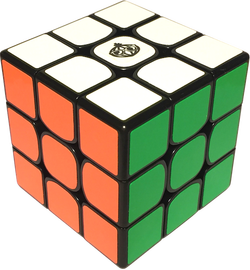 The MeiYing has a fluid and clicky feel to it; more precise than most other cubes. Out of the box it took a little bit of tuning to get right, initially it felt like there was slightly higher friction through the core, however this problem eases after time. My preference is about 1 full-turn loosened on all screws from box settings. Any looser and fingers can get caught between the pieces. Would recommend this cube to all. It starts off relatively fast out of the box, and only gets faster as it breaks in. Corner cutting, and lack of popping are just as good as everyone is saying. Can execute algs faster than any other cube. This cube is so far amazing. Even though many cubes had come out this is still the best cube in the market in my perspective. This cube is a perfect cube for anyone who wants a new speed cube. It came very tight, so I had to loosen it a lot. It sometimes corner twists because of the loose tensions, but it rarely is a problem. In my opinion, the Meiying is one of the best speedcubes on the market. This cube is a very good main. Its speed is perfect for me right out of the box. I do not own any lube and it worked great without it. The cornercutting is really good as expected. There is very minimal locking; the only time is the small are between the reverse and normal cornercutting "sweetspot". Corner twists do not happen with the squared corners except when I was teaching my cousins for christmas they received some due to their turning style. It has not popped on me once. Over all I give this puzzle a 5/5 because it could be anyone's main and is mine. This cube is for people with a fast light turning style. I personally had to lament with Traxxas 50k multiple times to slow to down. The Meiying is an Awesome cube, It's got a great feel: Crispy and hollow. Its quite fast yet controllable, rarely locks , and has never corner twisted or popped on me. The Meiying also keeps it shape pretty well, its not the most stable cube though. 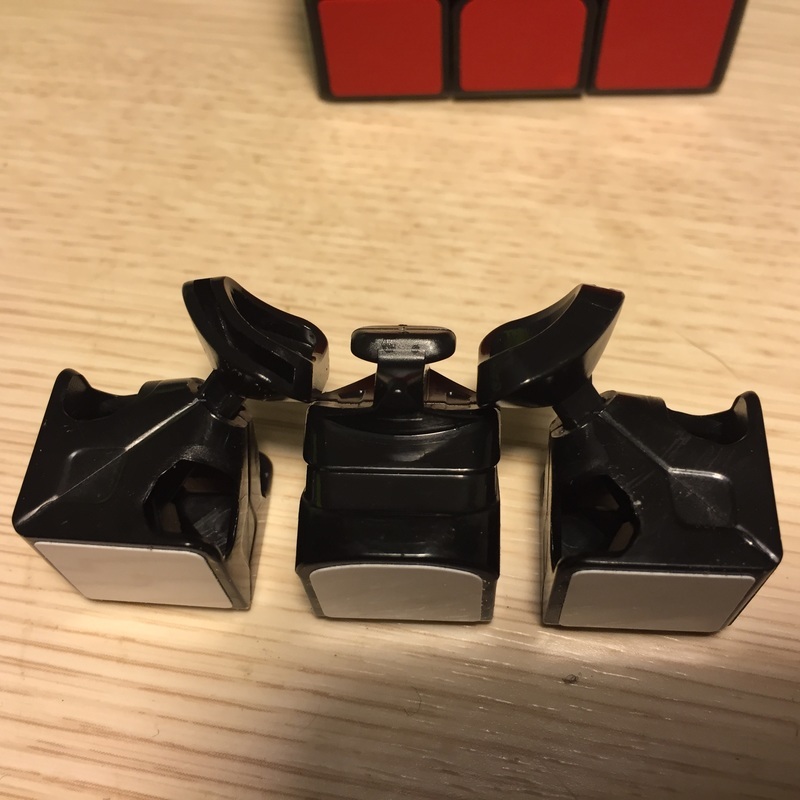 this cube is a strong contender for my main along with the Haulong and i recommend this to just about anyone. It is very fast so I lubed it a bit more so I could control it a lot better. After that I could control it a lot better and it got a nice smooth feel. Speaking of witch this cube has a very light, airy feeling added with a bit of smoothness thanks to my overlubing. Locks, catches, corner twisting and pops are minimal to none and there is nothing to worry about. I highly recommend this cube and I do not think that this is a meaningless cube to add to your collection. Out of the box it has a nice airy feel which I enjoyed. The cube was fast but not too fast however when I lubed it with Traxxas 50k it was amazing. It rarely locks up and corner cuts great. I've never had a corner twist or a pop and it was difficult for me to even take it apart. Let's go through each category. Speed: This cube can be fast. i would say it is too fast since I need to add lube just to slow it down! Corner-cutting: There really is no place where this thing wont cut. It does forward and reverse with ease. Corner-twists: I was able to force a corner twist once in over a thousand solve. It is next to impossible to get one normally. Popping: One of the hardest cubes to pop. I cannot get an edge out with loosing the screws. This is the best of the best. This should be everyone's main, and at 56mm it feel just a bit better in the hand. Cong's design Meiying speedcube is 16 dollars at TheCubicle like speedcubes they are coming out. 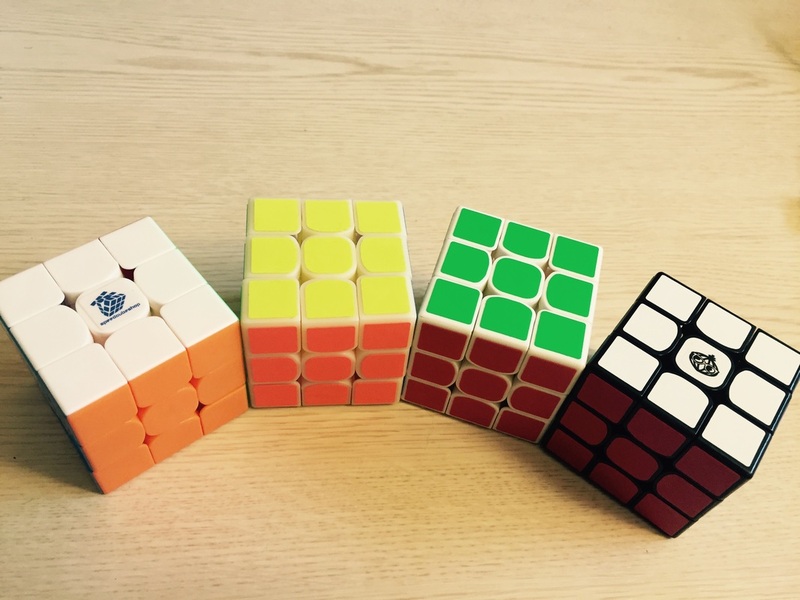 Speed is fast but not very fast as like MoYu or Gans cubes. Corner cutting is great and does 55 degrees cut and reverse is about 35. 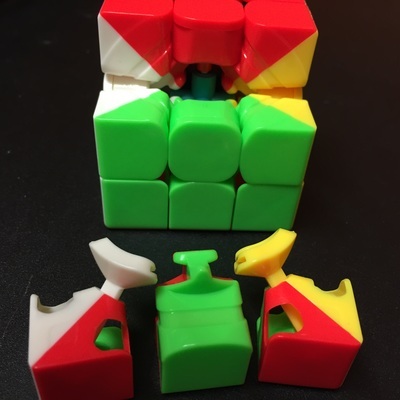 Locking can't happen and corner twists are impossible due to those squared corner pieces. Popping doesn't happen. Overall feeling is really crunchy so I will give it a 4-star out of 5. This cube is nearly perfect. I got it thinking it might be my OH main, but it turned out to be the perfect cube for 2H for me. It is somehow fast yet totally controllable. It has a somewhat crunchy feel, but the turning is light and almost effortless. It corner cuts incredibly well. While the cutting itself isn't exceptional, it's almost effortless everywhere I need to cut during a solve, meaning that the only lockups occur when I try something really stupid (so about once every average of 12 or so). I've never had a pop (on my relatively loose tensions, it's incredibly difficult to get a piece out when I'm trying to) and the only corner twists I've gotten have been intentional. This cube is absolutely amazing, and I can't wait for the next one to arrive. I'd recommend this cube to pretty much anyone to whom the above appeals. This cube was incredibly fast out of the box. It has a light, airy feel and a slight scratchy feel as well. One thing to note, however, is that the cube is very loud. It effortlessly corner cuts 60 degrees, and reverse corner cutting is excellent. 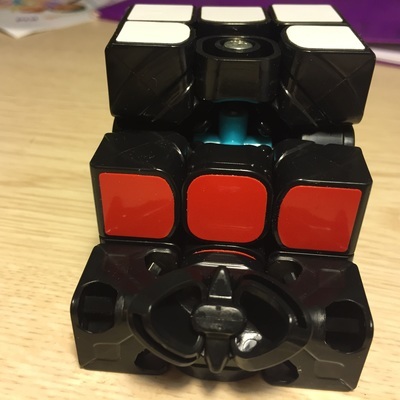 Also, after comparing it to my Aolong, I have found that the cube is actually 56 mm, instead of the standard 57mm. Overall, I really like this cube and will be making it my main.